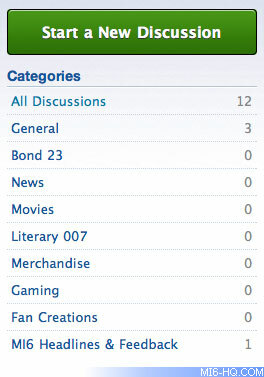 MI6 is proud to announce its new interactive community where James Bond fans from around the world can gather online. Dubbed, simply, MI6 Community, the new system will be familiar to those who use online discussion systems - but with some major minor improvements and subtle differences. Registration is easy - all you need is to pick a username (your online alias) and enter your email and desired password. MI6 respects your privacy and keeps all of your personal information hidden from public view by default. You can share more or less details with the other community members by adjusting a range of settings on your profile. The CAPTCHA security check is an anti-SPAM formality. Just write the words or letters you see in the distorted image into the box provided. If you are a Facebook and/or Twitter user, you do not need to register - simply click the respective button (above the 'Sign In' button) and authenticate your account. Once logged in, you will be presented with an up-to-the-minute list of the most active discussion threads. In the Community, a "Discussion" is the topic or subject of the discussion, and is laid out by the discussion initiator (you or one of your peers) and fans can add "Comments" (replies) to the discussion - these are follow up posts or points you wish to raise. Simply click the discussion title to read. Still on the home screen, and below the discussion title, you will find the "meta-data" that relates to the topic. This will tell you who has posted here most recently, how many comments have been made and what category the topic is filed under. You can click any category name to sort the discussions by that category. If you are involved in any current discussions in the Community, a yellow box will display below the discussion title, altering you to view the number of new comments since your last visit to the discussion thread. Additionally, if the discussion has come to a close, it will be marked as such. Topics are closed by MI6 staff if they are irrelevant to the Community, have been discussed before elsewhere, run their course, or to prevent needless argument. If you have started a discussion or made one or more posts, above the list of the latest topics will be two buttons: "All Discussions" and "Mine". By clicking the latter, you can filter the home screen by only those discussions in which you have already participated. To the right of every Discussion is a grey star icon. By clicking this you can bookmark a discussion as a favourite. A new panel will appear in the right hand column entitled "Bookmarked Discussions". By default the system will keep a record of these on your personalised homepage, so no matter where the topic ends up it will be easy for you to find at a later date. Users also have the opportunity to be alerted via email whenever someone comments on a favourite or bookmarked discussion. You can undo/delete a bookmark by clicking on the gold star next to its title. On the right-hand side, you will see a list of categories. These are administered by MI6 and dictate the broad topics for new discussion. If you are signed-in, above the category list is a large green button, inviting you to begin a discussion of you own. Discussions can be read by all members of the community and replied to or commented on by those that have accounts. When you start a discussion be careful to choose the most appropriate category for your message. If in doubt, choose the default, "General", and one of our staff, known as Moderators, will help you find a home for your message. Below the categories on the Home Screen are a series of important links - these include terms and conditions of Community use, a guide for new users and a method to contact the Community team-members if, for instance, you get locked out of your account or have any questions at all. Left: The Community sidebar, as seen when logged in. This includes links back to the main MI6 website, links to view the latest "Activity", "Categories" and "Discussions". Activity constitutes users' non-discussion interrelations and actions - much like the Facebook news feed or headlines feature. This will allow you to keep taps on the MI6 Community at large. At the top the of the website, whilst logged in, will be the options that relate directly to you. Left to right is: your username, your private inbox and a log out button. 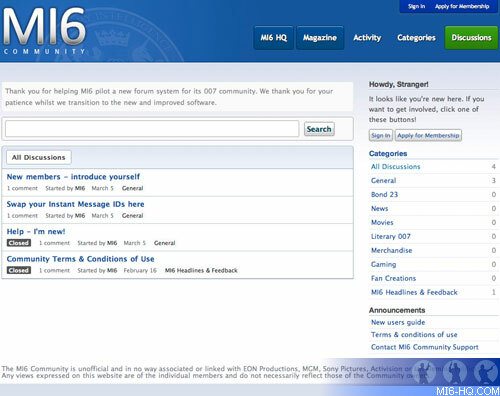 By clicking on your own username you will be directed to your profile at MI6 Community. Here you can keep track of your "Notifications" and read public messages that fellow Bond fans have written to your "wall". Much like Facebook, your wall is a public space where you can share ideas and comment on others' messages to you. These are not directly related to MI6, James Bond or any other service but, it is a useful way to communicate with your fellow Bond fans. Notifications will help you keep track of who is talking to you and when. Just like in the Community - a high level of courtesy and respect is expected to be accorded to all members. Your profile page will also unlock a series of customisable options: you can change and upload a picture from your computer to serve as an icon. Once uploaded you can choose the option below your profile "Edit My Thumbnail", to crop and define a smaller part of the complete picture for display on the discussion and comment pages. If you sign-in via Facebook or Twitter, your profile picture will be used by default. 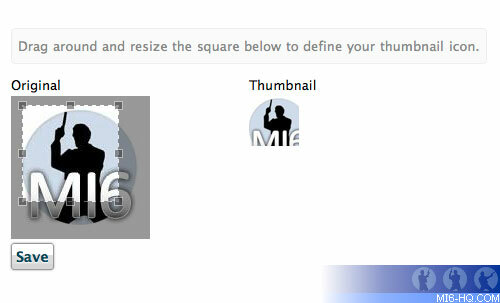 Above: Resizing a photo or 'avatar'. When you edit "My Preferences" you can switch on and off the kinds of notifications you receive about actions by others that involve you. If do not wish to receive notifications these can be unticked and you can check your profile and notifications area for this information instead. The inbox is a private message system. You can carry out small discussions between two or more users. By clicking inbox in the toolbar you will see any messages, much like emails, that have been sent to you via the Community. You can start a new Conversation between your friends (looking them up by Username) via the green button to the right of the screen. 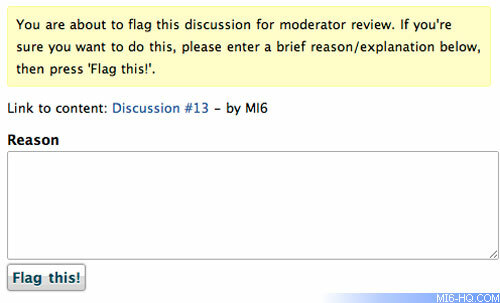 If you are concerned that a comment is in breach of the forum terms and conditions there is the option to flag a post for the MI6 staff's attention. Flagging a discussion asks you to give a "reason" for the offensive content of the post. By performing this simple action you help our staff to track down conflicts quickly and deal with them in the appropriate way. Only MI6 staff will ever see who has flagged what - your name is never publicly associated with the flag. Above: Flag a post as inappropriate for the attention of MI6. This is a convention popular on the social networking website Twitter. By placing an @ in front of a user's name, you can "tag" them in any post. This will allow you to refer to any user and later, allow people to click on the @tag to view that user's profile, contact them or post to their wall. Just write @Username to tag your friends. Whilst different from many other quote functions, the MI6 Community quote system will allow you to highlight the text in a Discussion or Comment to which you wish to respond. A popup will then ask you if you wish to quote that text. Clicking "Quote This Text" will format the highlighted text in a new post, clearly identifying the user and post to which you are referring.